It is great to see manufacturers branch out from the norm and come up with fresh pen and pencil designs. Zebra takes it a step further by holding an annual contest for young designers around the world, and the Zebra Arbez Piirto was the winner of the 2011 event. The winning design is based around the slim and simple form of an ice pick, which makes sense when you realize the designer is from Finland. It is quite stunning, especially when you consider that part of the design process was to make it as inexpensively as possible. Mission accomplished on all fronts. Many pens use a rotation or twist mechanism to extend and retract the pen but where the Piirto differs is that the mechanism is in the grip area as opposed to the upper barrel area. It functions quite well and does not get in the way of the writing experience at all. What does get in the way of the writing experience is the ballpoint ink cartridge. This is your basic cheap ballpoint refill, so set your expectations accordingly. A Zebra Surari refill would make this pen a knockout but would also raise the price, which goes against the reason the Piirto was created. The Piirto ballpoint is available with black and red ink cartridges as well as a black barrel design. There is even a mechanical pencil version that is designed similarly. While it may not perform like a world beater, the design and price made it an easy choice to add to my collection. 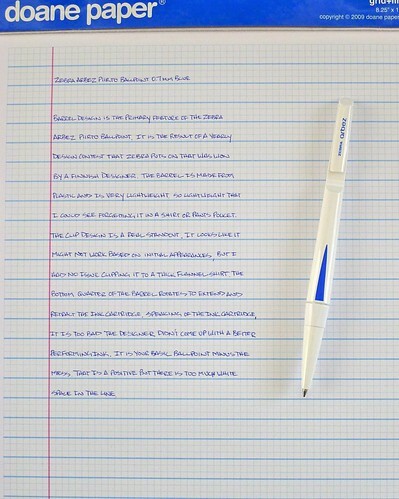 Posted on February 1, 2012 by Brad Dowdy and filed under Ballpoint, Pen Reviews, Zebra.